As a holistic woman, I always choose herbal formulas whenever possible for myself and my family. Sainthood Herbs has a full line of naturally made herbal supplements including products in the Boost series, Solution series and Women series. What makes Sainthood Herbs attractive to me is that it is made with “natural, healthy, safe, non-GMO, sustainable and eco-friendly ingredients. I appreciate that the products are also developed to work together synergistically. I have tried two products from Sainthood Herbs including the Stress & Sleep and Weight Management herbal supplements. I am a homeschooling mom and writer with three young children ages 6, 7 and 8 so stress is a constant in my life. Since I know that this can be very detrimental to health, I was very interested in trying the Stress & Sleep formula. Stress & Sleep features wild-crafted herbs including Lemon Balm Extract and Chinese Mint. I took three capsules in the evening after the children went to bed for thirty days. I like that this product is very subtle so it didn’t make me sleepy but I was definitely more relaxed and towards the end of the thirty days I noticed that I was sleeping better at night i.e. not waking up as much throughout the night. A bottle of 90 vegetarian capsules retails for $28.95. I am also using the Weight Management formula (SRP $28.95). 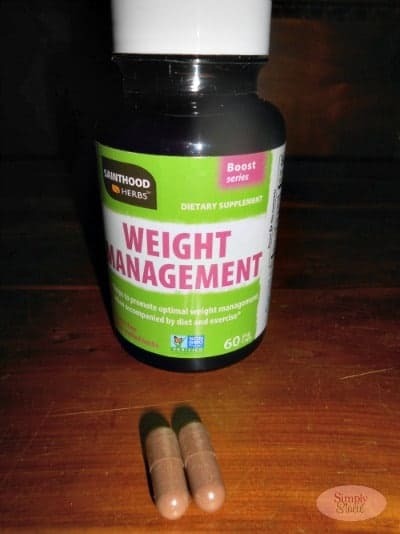 This product is a refreshing change to all those weight loss products that use harsh stimulants and chemicals as Weight Management by Sainthood Herbs uses Kelp Extract, Grape Seed Extract, Turmeric, Chinese Hawthorn and Bitter Orange. Several of these products (kelp and turmeric) had previously been recommended to me to supplement the thyroid so I looked forward to trying this product. I have been taking 2 capsules daily along with a structured organic eating program and moderate exercise and have a total weight loss of 9.6 pounds (15 days). There are so many wonderful herbal supplements available at Sainthood Herbs and I look forward to trying several others including Mental Agility and Blood Glucose. You are invited to visit Sainthood Herbs to browse the product line and choose the right herbal product for your needs. I’d probably give the STRESS & SLEEP a go.